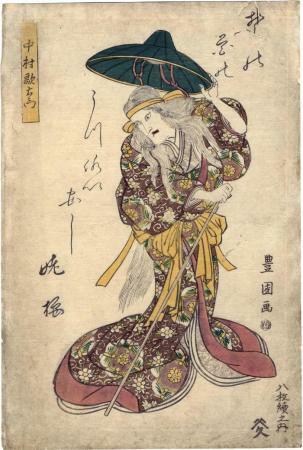 This print is just one from a series of 8 representations of Nakamura Utaemon in various roles. The range is considerable and forms quite a tribute to the versatility of this performer. This print represents a dance performance (shosa - 所作) which accompanied the kabuki play Godairikli Iro no Minato at the Nakamura-za. "When puppet plays were brought into the kabuki repertory, actors mimicked the actions of the puppets; in dance plays actors may move stiffly, like puppets, for comic effect. The overall style of dance in kabuki, called shosa - showing-the-body - fuses rural and urban dances of the common people, characterized originally by lively leaping and dancing." Quoted from: The Cambridge Paperback Guide to Theatre, p. 188.